It’s funny how one thing leads to another. For instance, because Jeremy stayed home from work last Wednesday, I got to have wonderful memories of making snow ice cream as a child in Colorado winters. You see, we’ve been going home for lunch every day since we got Freyja… just one more way she’s turned our lives upside down. That meant that I missed the first Wednesday farmer’s market in downtown Salem. We walked down to the Saturday market with the pup the following Saturday, and she had an awesome time meeting folks and other dogs of all shapes and ages, but there wasn’t much in the way of foodstuffs for sale yet. 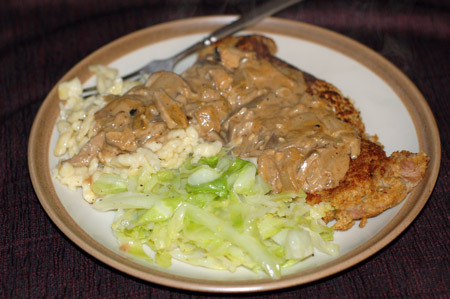 We did get some bags of lovely fresh oyster, shiitake, and maitake mushrooms for $10, which was very exciting (and with which I made the jagerschnitzel above), but I wanted more. So when Jeremy stayed home last Wednesday, I happily scurried off to the farmer’s market to see what I could find. The Wednesday market is definitely the place to find local fruits and veggies in Salem. I immediately snapped up some fresh leeks, gorgeous ruby red rhubarb, the requisite bunch of asparagus, and a pile of pea shoots for $1, which I’ve never eaten before. After work I lugged my pounds of organic booty home, along with a lemon thyme plant that is now safely tucked into my herb garden, and paged through cookbooks until I came up with a plan. The leeks and asparagus would go into a prosciutto-tinged risotto I’ve made before for my parents; the rhubarb (or at least part of it) would turn into rhubarb custard bars; and the pea shoots would be tossed into an orecchiette carbonara with bacon and blanched peas, from Sunday Suppers at Lucques . I’ve never made pasta carbonara before. It’s right up my alley in terms of flavor: creamy, eggy sauce with lots of Parmesan and, of course, bacon (plus, it kind of cracks me up that spellcheck suggests coronary as the best alternate spelling to carbonara). But the bit where the sauce is made of raw eggs that basically get cooked by stirring them into the hot pasta… that was a little intimidating. What if it didn’t work and the pasta ended up just covered with nasty slimy raw egg? I needn’t have worried, though I might have drained my pasta a bit more. The sauce came out creamy and not at all raw-looking, though a bit thin. 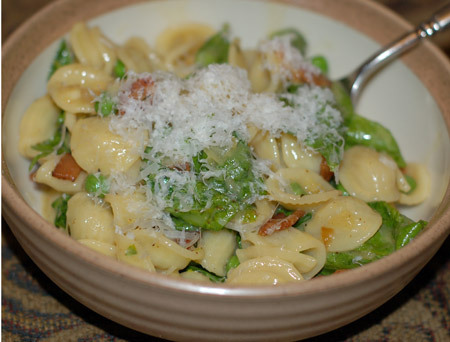 It was delicious, with lovely little bits of crisp bacon, onion and peas nestled into the orecchiette, one of my very favorite pasta shapes. The pea shoots didn’t particularly impress in terms of flavor, but I certainly got my dollar’s worth of enjoyment from them, just by smelling their peapod aroma as I snapped off the larger leaves and stems. Jeremy threatened to boycott dessert when he saw me with an armful of rhubarb, which he doesn’t care for, even when I brought out a plate of cooling rhubarb custard bars. His tune changed once he tried them, though, and later that evening I caught him sneaking back into the kitchen for seconds. These bars tasted like pie on top, with a much quicker (and I have to say, equally satisfying) shortbread crust underneath. I added vanilla, cinnamon and nutmeg to the custard filling, and it hit a nice balance with the gentle tartness of the rhubarb, especially when still slightly warm from the oven. Don’t worry… I’m still getting back around to the snow ice cream. To encourage you, here’s the recipe for the rhubarb bars. Preheat oven to 350F. Spray a 9×13 inch baking pan with cooking spray. Put flour and sugar in a food processor and pulse to mix, then add the butter and pulse until thoroughly combined. Press crust into baking pan. Bake for 10-12 minutes or until lightly browned. Prepare filling while crust is baking. In a large batter bowl, blend sugar and flour, then add eggs, vanilla, spices, and rhubarb and blend well. 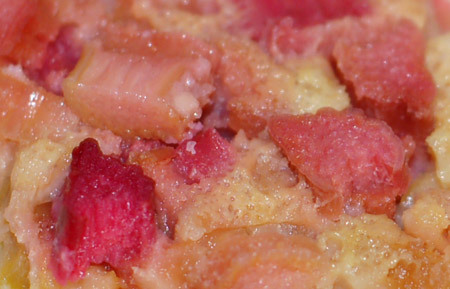 If your rhubarb is especially juicy, you may want to add some additional flour to thicken the batter. Pour this mixture over the partially baked crust and continue baking for 30-35 minutes, until set and lightly browned. Serve warm or cooled. Store leftovers in the refrigerator. Moving along, that orecchiette carbonara required more egg yolks than whites, so when I was looking into rhubarb options, I considered making a pie or bars topped with meringue. I’m not the hugest fan of meringue, though (give me whipped cream instead anytime), and meringue doesn’t keep all that well. Since I wasn’t convinced Jeremy would help me eat up the rhubarb, I didn’t want to be stuck eating soggy meringue for a week. 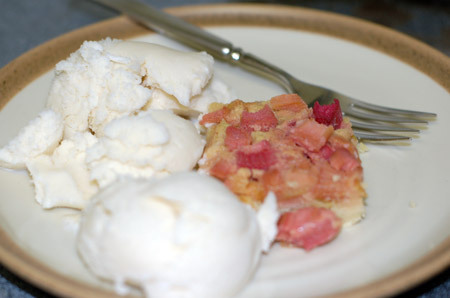 I decided to look at other options for my whites, and perhaps make some vanilla ice cream to go with the rhubarb bars. With no heavy cream on hand and no car to make a quick grocery trip, however, I was having problems finding something that would work…until, that is, I looked in the sorbet section of David Lebovitz’s The Perfect Scoop book and saw his recipe for leche merengada. I’d never heard of it, but made with whole milk, two meringue-ified egg whites and hints of cinnamon and lemon, I thought it was the perfect solution for my ingredient and accompaniment needs. 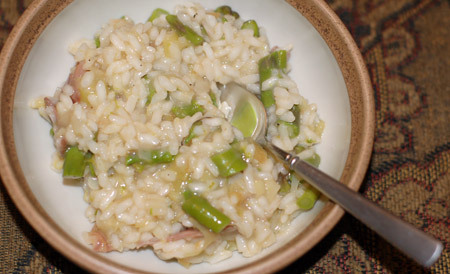 It took me a few days to find enough time to pull out the ice cream maker, but that asparagus-leek risotto afforded just enough idle time in the kitchen between ladling and stirring to get it going, and the next day we had frozen meringue sorbet with our rhubarb bars. What a lovely, unusual recipe. My whole milk sat in the fridge for an extra day or two after heating with the cinnamon and lemon, so I strained it before mixing in the meringue, but the flavors come through beautifully. After all that, Jeremy didn’t care for the merengada in conjunction with the rhubarb bars, preferring each separately, but I thought they made a great light pairing for spring. The thing that really struck me about the recipe, though, was how much it reminded me of the snow ice cream I used to make as a child. (There it is! Patience rewarded…) You know the stuff—a bowlful of absolutely fresh snow, scooped into a big bowl while the snow was still falling, then mixed with milk, sugar and vanilla extract until you ended up with a sweet, soupy concoction that had to be gobbled up at top speed before it completely melted. Leche merengada is what I always wanted snow ice cream to be: Snow white and lightly sweetened, not too hard out of the freezer, and with an almost crisp texture that melts instantly on your tongue.